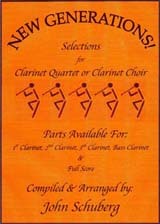 This is a wonderful collection of ten works for Clarinet Quartet or Clarinet Choir edited by the University of Montana Clarinet Choir. Works by Pachelbel, Handel, Bach, Mozart, Bizet, and Tschaikowsky are masterfully arranged to sound rich and full. These pieces are accessible to both high school and collegiate ensembles.